Mabel Elizabeth King (née Washington; December 25, 1932 – November 9, 1999) was an American film, stage, and television actress, and singer. She is best known for her role as Mabel "Mama" Thomas on the ABC sitcom What's Happening!! from its premiere in 1976 until the end of its second season in 1978. King's next most remembered role is that of Evillene the Witch, a role she originated in the stage musical The Wiz and reprised in Sidney Lumet's 1978 film adaptation. She made recordings with Rama Records and Amy Records. Mabel "Mama" Thomas – What's Happening!! King was born Mabel Elizabeth Washington in Charleston, South Carolina, the daughter of Rosalie Washington and Joseph Washington. She was raised in Harlem, New York where she eventually became a gospel and nightclub singer. She did not start acting until her mid thirties, in 1966, when she played the role of Maria in the national touring play of Porgy and Bess. The following year she played the role of Ernestina in the Broadway musical/comedy Hello, Dolly!. Then in 1972, she appeared in the Broadway musical Don't Play Us Cheap. The following year, she appeared in the film version of the play. That same year, she played the Queen of Myrthia in the horror film Ganja & Hess. In January 1975, she played the role of Evilene, the Wicked Witch of the West in the all-African-American cast of the Broadway musical The Wiz. The role earned her a Drama Desk Award nomination for outstanding featured actress in a musical. Her performance in The Wiz brought her much attention and soon after she received roles in the films The Bingo Long Traveling All-Stars & Motor Kings, with Billy Dee Williams and James Earl Jones, and Scott Joplin, with Billy Dee Williams and Clifton Davis. In June 1980, King returned to stage work, starring in the Broadway musical It's So Nice to Be Civilized. However, the show did not do well and was cancelled after eight performances. In 1976, she was offered the role of Mabel Thomas on the sitcom What's Happening! !, a role she played from 1976 to 1978. Due to disagreements with the direction the creators wanted to take the series, King left What's Happening!! in 1978 after two seasons. That same year, she reprised the role of Evillene for the 1978 film version of The Wiz. It was the second time in her career that she appeared in a movie after being in the stage version, the first being Don't Play Us Cheap. The following year, she appeared in the film The Jerk as the mother to Steve Martin's character. King received mostly guest spots on television series including Fantasy Island, The Jeffersons, Amazing Stories and Tales from the Darkside. In between, she signed on with then Hollywood agent Ruben Malaret, who negotiated her reprised role of Mama Johnson in the made-for-TV movie The Jerk, Too (1984). Her last two movie roles were Scrooged (1988) starring Bill Murray and Dead Men Don't Die (1990) starring Elliott Gould. King was married to Melvin King from June 1967 until September 1989. They had one child, a son named Larry King. King was a staunch conservative Republican who strongly supported the presidency of Ronald Reagan. In 1986, King lost one of her toes due to diabetes. In 1989, King suffered a stroke and entered the Motion Picture & Television Country House and Hospital in Woodland Hills, California. King also battled diabetes, and eventually lost both of her legs and an arm to the disease. Her only child, a son, Larry (who was the eldest son of singer/songwriter Larry Banks) died in 1996. Mabel died on November 9, 1999 at age 66. 1979 Barney Miller Mother Zilla Episode: "Computer Crime"
1981 Palmerstown, U.S.A. Aunt Toog Episode: "Future City"
1983 ABC Weekend Special Mrs. Trussker Episode: "All the Money in the World"
1983 Lottery! Mabel Episode: "Los Angeles: Bigger Volume"
1984 The Master Willie Episode: "Fat Tuesday"
1984 The Jeffersons Mother Tobin Episode: "Some Enchanted Evening"
1986 Amazing Stories Jennifer Mowbray Episode: "The Sitter"
1986 The Colbys Fortune Teller Episode: "The Honeymoon"
1986 Tales from the Darkside Ruby Cuzzins Episode: "Baker's Dozen"
1983 Whiz Kids Episode: "Fatal Error"
1988 Wiseguy Mae Nina Episode: "Blood Dance"
^ DeCaro, Frank (2002). "The Dead Celebrity Cookbook: A Resurrection of Recipes from More Than 145". Google Books. Communications, Inc. Retrieved October 15, 2017. ^ Nussbaum, Ben (2013). "Wizard of Oz: An Over-the-Rainbow Celebration of the World s Favorite Movie". Google Books. I-5 Publishing. Retrieved October 26, 2017. ^ Bowler, Gerry (2000). "The World Encyclopedia of Christmas". Google Books. The Canadian Publisher. Retrieved October 26, 2017. ^ Group, Gale (2001). "Video Hounds Golden Movie Retrievee: The Complete Guide to Movies on Videocassette, DVD and Laserdisc". Google Books. Gale Group. Retrieved October 26, 2017. ^ "Mabel King Biography". filmreference.com. 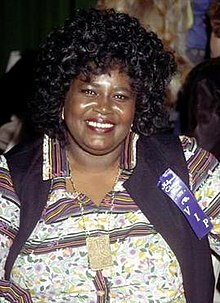 ^ "TV, Movie and Stage Actress Mabel King". Jet. Johnson Publishing Company. 96 (26): 56. 1999-11-29. ISSN 0021-5996. ^ a b c d Benjamin Franklin V (2016). An Encyclopedia of South Carolina Jazz and Blues Musicians. University of South Carolina Press.